Resource Generation is the only organization in the U.S. helping people confront and unpack class privilege and get organized around social justice philanthropy — being accountable to working class and poor communities and communities of color in movements for economic and racial justice. GET INVOLVED WITH RESOURCE GENERATION HERE. Through dynamic organizing, political education, chapter events, conferences, local campaigns, and being in community with each other, our work as an organization helps grow our membership of young people with wealth taking action toward the equitable distribution of wealth, land, and power. Since our founding in the 90s, our members have protested in the streets, spoke out at city council meetings, become heads of their family’s foundations, founded donor networks, and moved millions of dollars into social justice organizations. 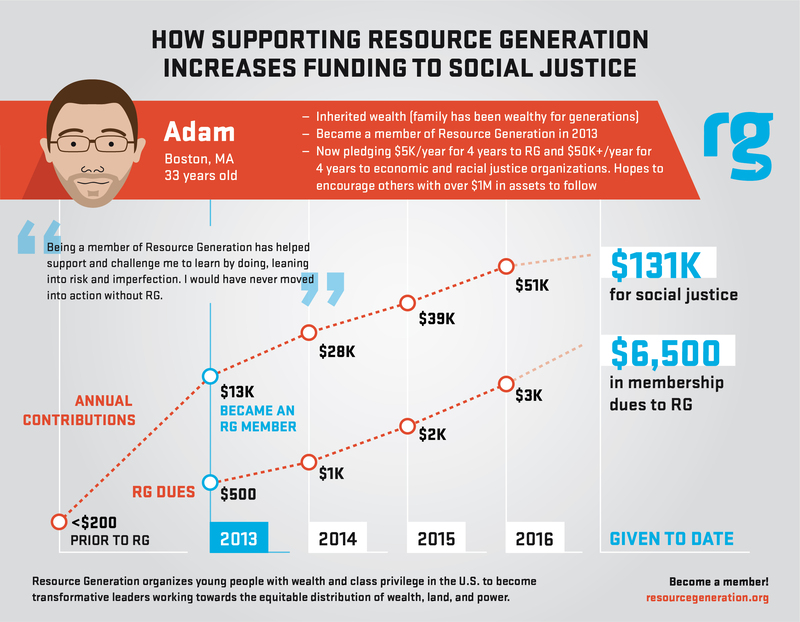 Our members give on average sixteen-times more money to social justice than they did before joining RG. A lot of of our members increase their giving by a lot more than that, too. Want to join as a member? Get started here. We are currently living through what’s being called a new Gilded Age. Not since the time of the Carnegies, Rockefellers, and Vanderbilts at the turn of the 20th century was so much owned by so few. Today, the top 10% own 77% of the nation’s wealth while the racial wealth gap continues to get worse — median Black family wealth is on a path to hit zero in 36 years. We have almost 500 members now, but we need to increase our membership and reach more young people with wealth in order to live into a future where wealth, land, and power are equitably shared. Being a long-term member and paying membership dues that significantly reflect your access to wealth helps our community do that. 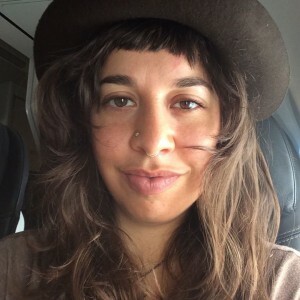 If you saw Iris Brilliant speak at Dreamforce: Compassion in Action and want to get in touch, email her at iris [at] resourcegeneration [dot] org. Iris is a National Organizer and Coordinator of Family Philanthropy Programming, the only national membership organization in the U.S. organizing young people (18-35) with wealth and class privilege in the U.S. to become transformative leaders working towards the equitable distribution of wealth, land, and power. Through its 17 local chapters across the U.S., annual conferences like Making Money Make Change, and national network, Resource Generation has helped thousands of young people increase their giving and move millions of dollars to grassroots organizations committed to economic and racial justice. For more than ten years, Iris has been engaged in institutional philanthropy and family giving. As a trained social justice and anti-racist facilitator at Intergroup Relations at the University of Michigan, she is passionate about supporting the leadership development of young adults in the philanthropic world and their implementation of social change values into philanthropy. She and her father have been collaborating on grant-making over the last decade through public foundations and their own personal wealth. Iris grew up in the Marin County, CA and currently lives in Oakland, CA. In her spare time, Iris is a singer-guitarist in a band, runs a climate justice group, and instigates conversations about money with strangers.